Okay, I guess this “cool weather” thing could be more than a trend. It might just be autumn now. 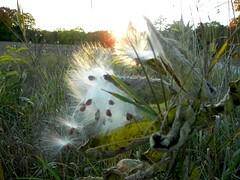 One day the fields were gold and the milkweed pods were green — the next day they’d cracked open and the fields were white with drifting silks.